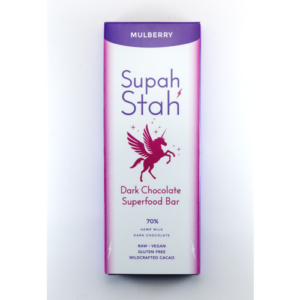 Read ALL about Supah Stah Dark Chocolate Superfood Bars here. "Best day EVER!! 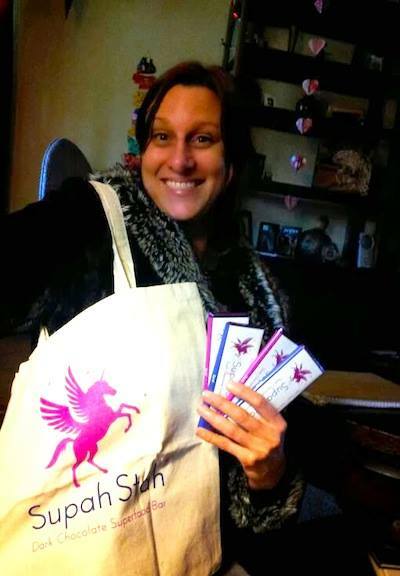 Thank you, Erika Wright, for making the most incredible, healthy, amazing, Supah tasty bar ever!!" "So excited for my treats. I may even share some. Maybe not. Shared 3. Kept 3 for myself. And I have to admit that I am feeling kind of supah!" "I just did, @supahstahchocolate and it hit tha SPOT! Thank you, @goodearthnatural for stocking the world's best chocolate!" 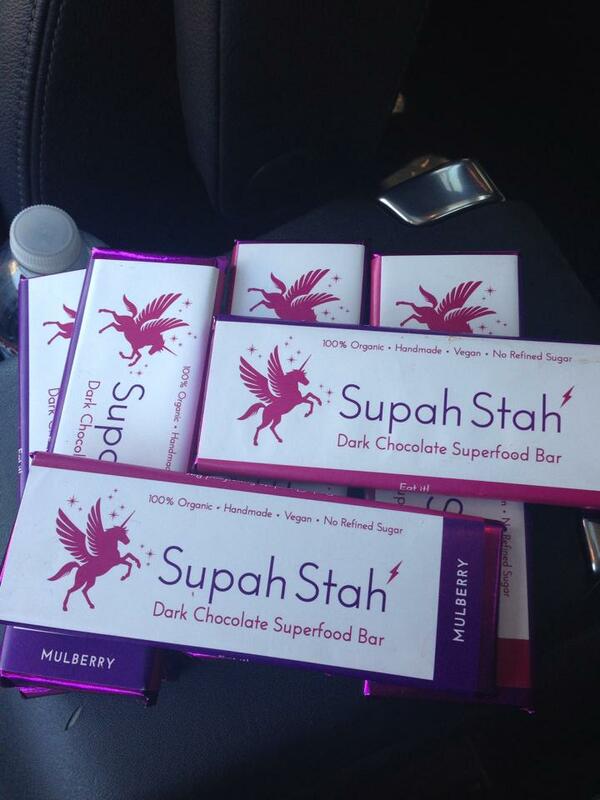 "Today I ate my very first Supah Stah chocolate superfood deliciousness, Mulberry flavor, yum! 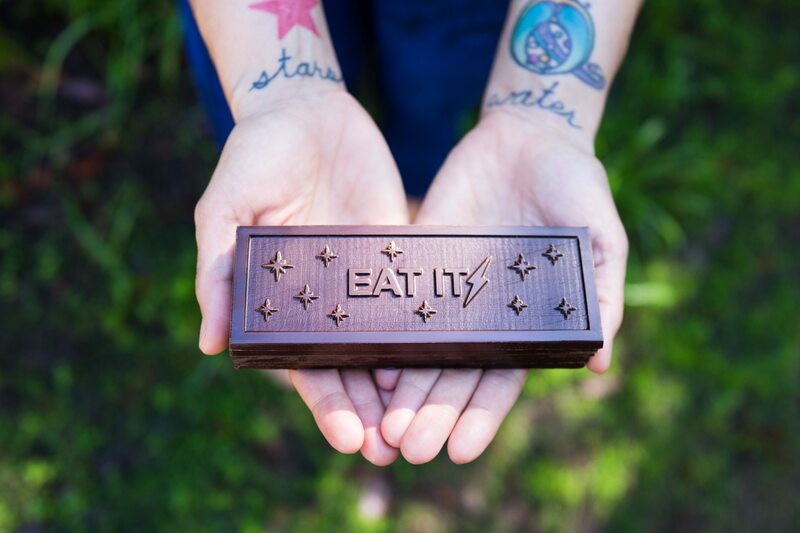 Amazing healthy chocolate from local artisan, FeatherWitch chocolate fairy, Erika Wright!" "For Valentine's weekend I am treating myself to the yummiest chocolate ever! This really rad chick I know @queenofthestarnation makes these handmade, vegan, superhealthy, superfood chocolate bars." "I love to start AND end my days with a Supah Stah bar. They are the perfect amount of sustenance for me on the way to a morning yoga class. The energy is quick, lasting & they're not too filling. I have a serious sweet tooth and often crave something after dinner or before bed time. 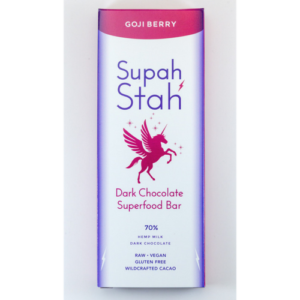 Supah Stah bars are so yummy, they totally satisfy my desire for chocolate and sweets and I know are so much better for me. I love them! I've probably tried hundreds of different power bars and super food bars over the years, I'm leaving them all behind and sticking with Supah Stah from here on out because they taste better and are better for me." Fueling up on the road! "I put a bunch in the rig's freezer before we left. Gave some to our friends in New Mexico, but saved a few for emergency rations!" These bars will SAVE YOUR LIFE! 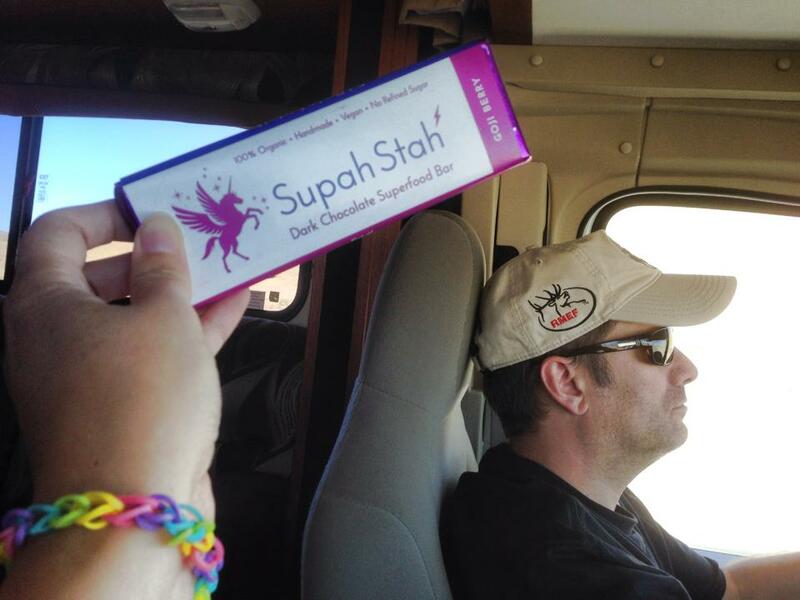 "Supah Stah chocolate power bars are a lifesaver! I am a new mama, a yoga teacher, and a singer in a rock n roll band so I don't have a lot of time to prepare snacks. The bars literally save me daily. I eat them for breakfast, as snacks in between meals and whenever I need a pick me up. They are totally satisfying and I feel more present, more able to focus and smarter after eating them. I get the physical energy I need too! To take care of my newborn, practice yoga and to dance and sing on stage! I learned from Erika that cocoa is often considered a treat and doesn't get the credit it deserves as a SUPER food. It is to be enjoyed anytime ALL of the time. And together with the other SUPER food ingredients these bars will SAVE YOUR LIFE!" 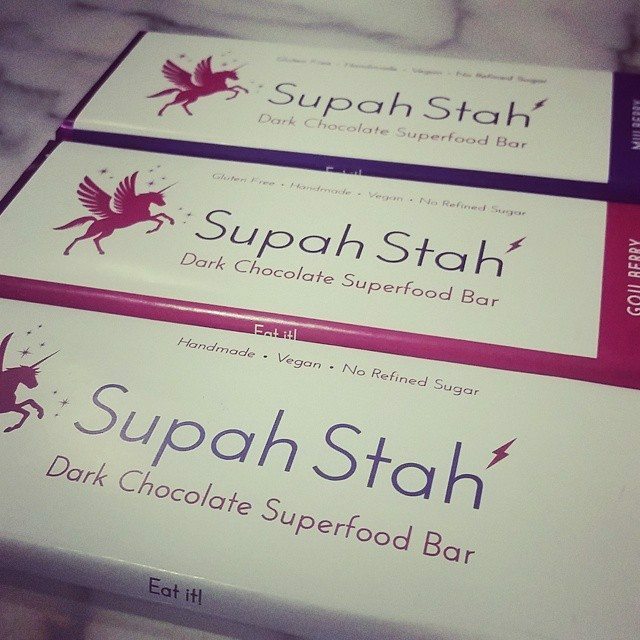 "Supah Stah chocolate superfood bar is sooo good!! The flavor is mellow and yummy, the consistency is rich, has lots of nutrients, and I felt energized for hours after eating it. I can see that I'm gonna need to keep a supply of this AHSOME bar around at all times." I am Supah Woman now! 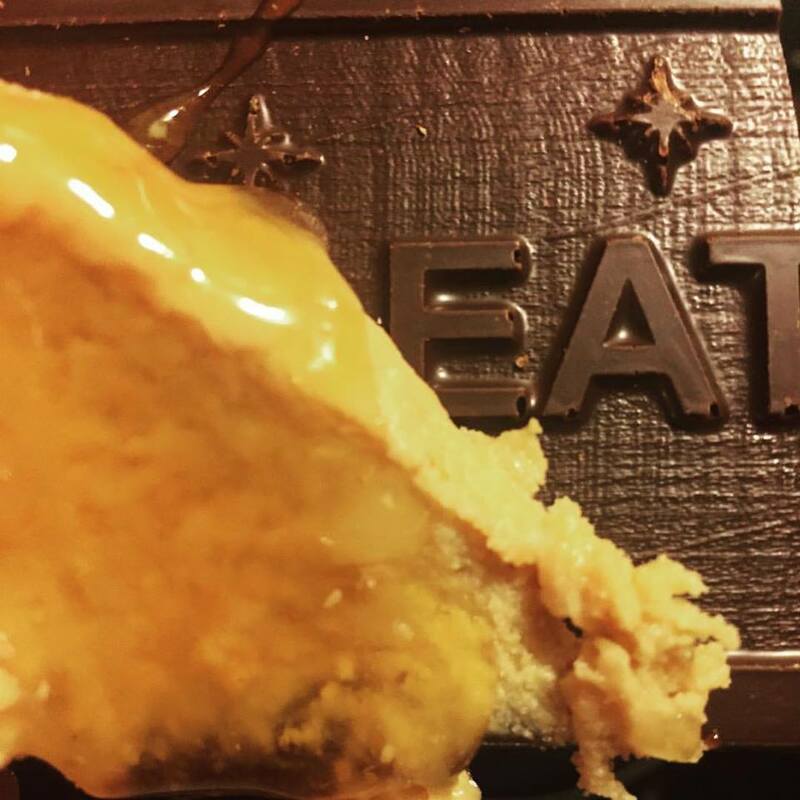 "About to eat the most delicious, most healthy satisfying chocolate bar ON THE PLANET!" 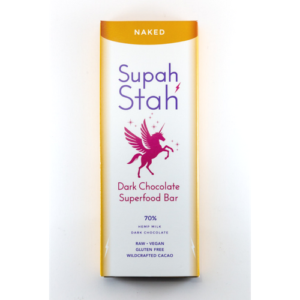 "We loved having Supahstah Dark Chocolate Superfood Bar share their fabulous dark chocolate superfood at our winter solstice retreat over the weekend! 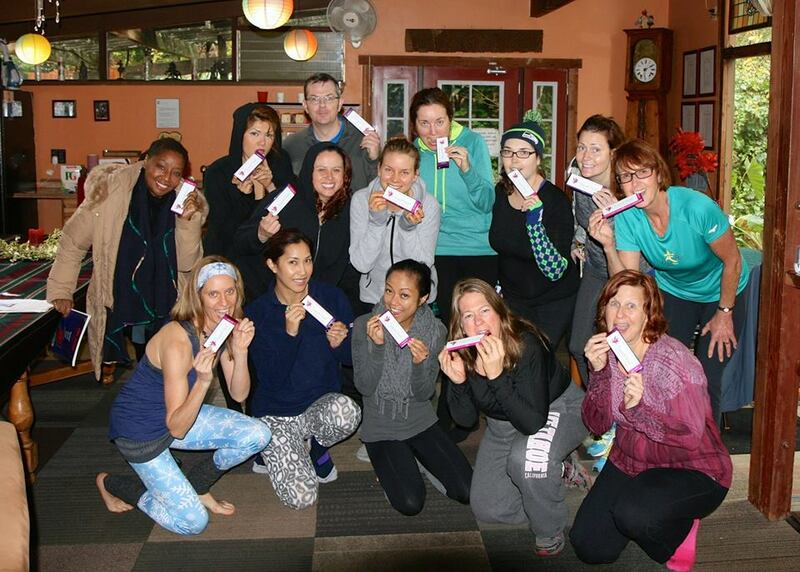 Their mission is to make people HAPPY & HEALTHY with these nutritional bars because happy humans makes a happy planet. Perfect holiday gifts for everyone! Buy some here and EAT IT! Thank you!!" "I am writing to you to say a great big "thank-you." Yes, I really enjoy your SupahStah chocolate bars (that's why the'y're in our house every week), but my actual thank you pertains more towards the packaging you have chosen to use. I just watched a film called "A Plastic Ocean." Hard to watch, but important for every human to see. I learned about how plastic breaks into smaller pieces but never bio-degrades. As you probably already know, sea creatures at all levels of our marine ecosystems are being killed by human-made plastic pollution. That same pollution, when it breaks into small enough pieces called "micro plastic" works its way back into the food stream and onto people's plates. I cannot in good conscience continue to consume products wrapped in single-use disposable plastic packaging. So, every time I eat (for what could be the last time) a snack food that is wrapped in conventional plastic I've been emailing the manufacturer to request they change to a more responsible package. Yours is literally the very first bar-food I've encountered that is not wrapped in petroleum. Imagine my surprise when I realized it was you! Maybe its the Fairfax flowing in our veins... Thank-you so much for doing the right thing. Rock-On!" "One of my most favorite ways to EAT IT...with peanut butter and raw honey. That's what's up." "Supah Stah Dark Chocolate Bah was THE best treat of the entire holiday season...I've been giving them away as gifts and getting rave reviews in return...I'm hogging my last 3 bahs, in the freezer. Your product utterly rocks, like the mad genius who made up the recipe!" "The world is officially a better place now that Supah Stah bars have arrived... including every chocolate shelf in every store in the whole Universe!! Wahoo!! Best chocolate moment ever. Thank you Erika! "I just ate a whole Mulberry bar and feel uplifted, yet not sick to my stomach. Bring on the Yum...oh yeah and my antioxidants." 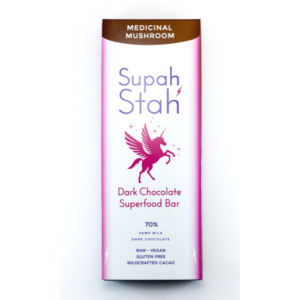 "I don't believe it is ANY coincidence that I served up some Supah Stah dark chocolate superfood goodness at our Sound Medicine Healing yesterday and we got the most positive response & financial offerings to date." "This food is gonna save your soul, one morsel at a time. I dare you to love yourself that much! I eat it because I can follow directions on the side of the package. Now you try it!" 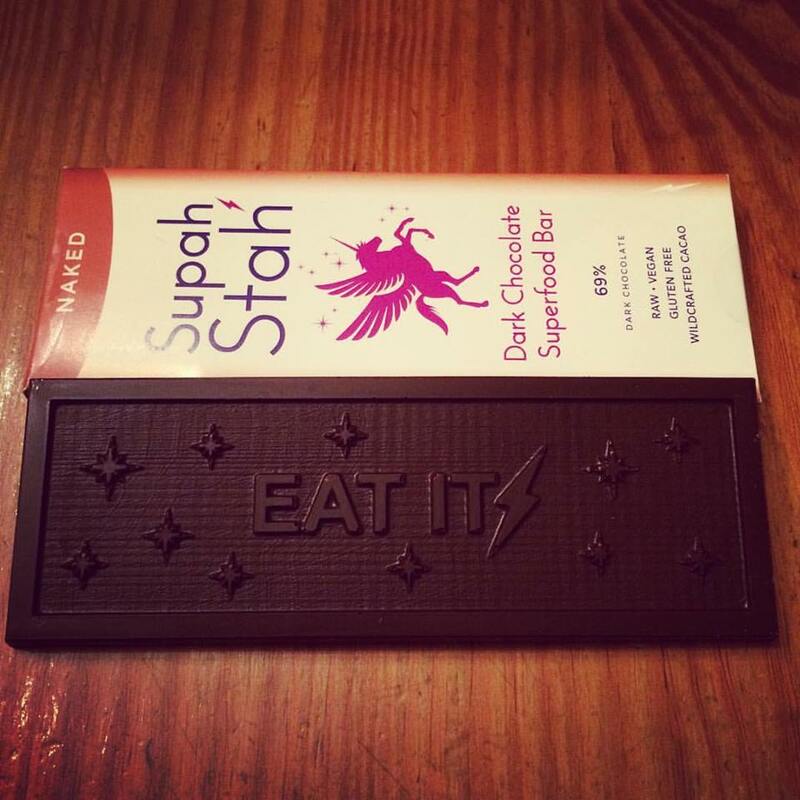 "Supah Stah Chocolate, not only does it taste amazing, but it's actually really good for me. These bars sustain me when I'm hungry and need a boost, and also provide me with long lasting energy. No bursts of sugary energy only to sink into a sugar crash. This is the real thing. Did I mention it tastes amazing?" "Supah Stah bars are pure energy. I'm totally hooked! The chocolate is rich and buttery, the goji berries are sweet and chewy, and the chia seeds add a light crisp making this superfood bar so satisfying. SupahStah chocolate possesses the winning combination of being amazingly delicious AND super-healthy." Get ALL the Supah Stah Love! Save 10% on your order when you sign up for our email list. 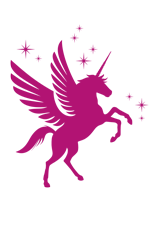 We don't always send emails, but when we do they are SUPAH awesome and include discounts for you!